There are several uses for mandrel bends….exhaust tubing, downpipes, intakes, etc. They work extremely well for intercooler pipes or intake tubing as well. The smoothness of the mandrel bends allows for optimal airflow unlike typical exhaust benders, which create a crushed/crinkled bend that impedes airflow, decreases the optimal airflow, creates turbulent flow inside the tube and is not aesthetically nice looking. Create your own custom headers or exhaust system with our assortment of mandrel bends to give your engine the right balance of exhaust flow, backpressure and most importantly, fit within the required space. These steel mandrel bends are made from mild steel (not aluminized), cold-rolled, flash controlled tubing. This product is sold per bend, but multiples or premade assortments can be ordered and shipping will be combined. They are available in sizes 1.5”, 1.625”, 1.75”, 2” (outside diameter) with 45, 70, 90, 120, 180 degree bend and have a wall thickness of .065” (16 gauge). Q: Does mandrel bent tube really make a difference? A: Mandrel bent piping stays at the same diameter through every turn, bend and twist. Normal exhaust tubing bends will get smaller and wrinkled in the bends – which can be quite restrictive. 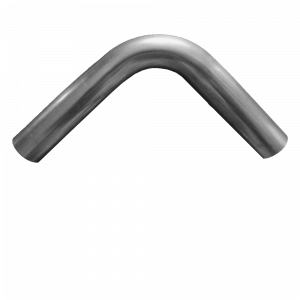 We would strongly recommend mandrel bent tubing for your custom headers or exhaust system. Q: Why is mandrel bent tube better? A: Consider a straight plastic straw that you might use to drink a soft drink. If the straw is completely straight, it’s very easy to blow air through the straw, as there are no restrictions. However, let’s say you decide to bend the straw 90 degrees into an “L” shape. Now, blowing air through the straw will be very difficult, as the opening at the straw’s elbow will have changed from a circle to a very narrow slit. This is exactly how the tubes in your car’s intake and exhaust system work. Air is drawn through the intake or pushed out the exhaust, which, when “compression bent”, can become very restrictive to the flow of air. Mandrel bending is the solution to this problem. Mandrel bending works due to special tooling (mandrel) that is inserted into the inside of the tubing and prevents the tube from crushing or kinking while the outside of the die bends the straight tube to its desired angle. When a header, exhaust or downpipe is manufactured with mandrel and machine tooling allows the steel to stretch on the outside of the bend, maintaining the nominal tubing diameter. Exhaust gas follows fluid dynamic concepts. You want to eliminate backpressure while maintaining exhaust gas velocity. Mandrel bending allows the hot exhaust gases to flow with less turbulence and therefore a more consistent velocity. Cold-Rolled steel. What is it? Cold-rolling is a process that is performed close to room temperature to form steel into its desired shape. It is done in order to hold tighter tolerances during the forming process and control quality. Cold-rolled tubing also has a bright finish with no mill scale as seen with hot rolled products. This allows for a much cleaner and more precise product when mandrel bending and allow for more consistent bends. All of our steel mandrel bend options are made from high-grade, cold-rolled, flash controlled steel to insure the best bends possible and creating a consistent product for our customers.